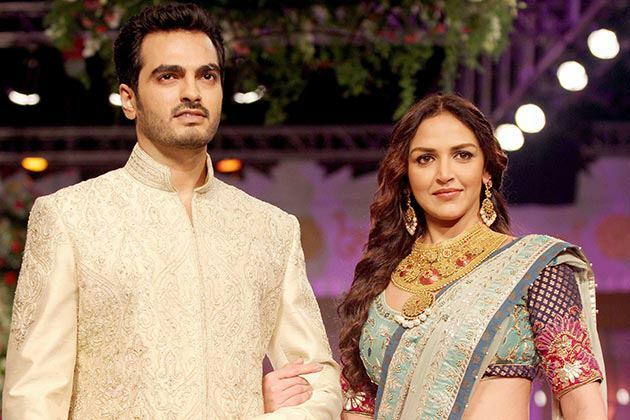 Way back Esha Deol had declared that she desired a husband as devastatingly handsome as father Dharmendra, so it must have been a tall order for businessman Bharat Takhtani when he set out to court his childhood sweetheart. But Bharat was determined and destined to win his bride. “If you find someone with whom you’d be able to spend the rest of your life, someone whose face you wish to see before going to sleep and on waking up, then it’s beautiful. 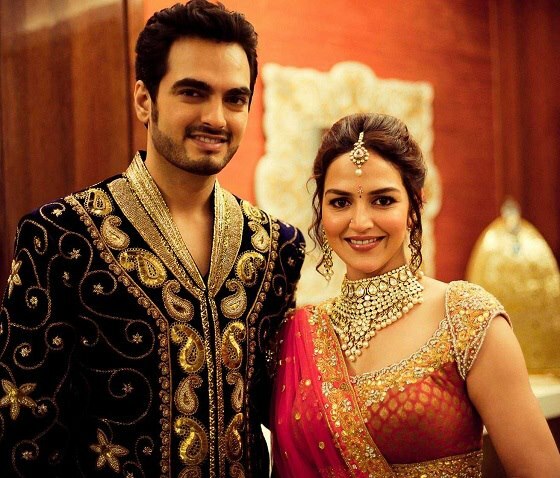 I can’t understand the arranged marriage concept; I had to fall in love to get married,” says Esha romanticising the milestone in her life – her marriage to Bharat last June. You can’t miss the newlywed vibe about Bharat and Esha as they cuddle together for their first interview as a couple at the dance foyer in mother Hema Malini’s plush multi-storey home. Esha reveals that it was in this very hall that she and Bharat got engaged. “When we were getting engaged I told him, ‘Baby, you’ll have to go down on your knees and then slip the ring on my finger. Bharat asked, ‘Really?’ and went down in the presence of papa, Sunny bhaiya and Bobby bhaiya, right here,” smiles Esha. “From the industry only Jaya (Bachchan) aunty was present. She’s like a mother to me.” Bharat’s and Esha’s love story has all the trappings of a Hindi film. The two fell in love years back when they were in their school uniform. “I studied in Learner’s Academy in Bandra and she in Jamnabai Narsee School in Juhu. We often met at inter school art competitions." "I developed a huge crush on her,” Bharat confides saying he was around 13 then. “There was a certain freshness and cuteness about her. We began seeing each other.” Esha adds, “But it was an immature, stupid age. Once when he wanted to hold my hand I snapped, ‘How dare you hold my hand?’ “After that she stopped talking to me,” rues Bharat. “Though I didn’t keep in touch with her, I remained friends with Ahana (Esha’s younger sister). So somewhere the connection remained. I always nurtured a soft corner for Esha. After all, she was my first love.” The two reconnected 10 years later and began dating again. But before that a cautious Bharat asked her, “Now, can I hold your hand?” This time, Esha not only gave a nod but allowed him to hold it forever. Bharat believes marriages are made in heaven. “It seems impossible that someone from a film family and I who am from a conservative business family would ever come together,” he states. “She’s the first bahu in our joint family of seven cousins,” he says to which Esha adds, “Just like mom’s character in Satte Pe Satta.” Bharat, whose family lives in Bandra, is delighted with Esha’s inclusion in the fold. “She takes care of my mother, her moods, she’s gelled so well. Actually, Esha’s always been gharelu though she liked to believe she was the boy of the house. She’s caring and responsible. She’s aware of what keeps me happy. I’m a foodie, I live to eat. And she sees to it that my favourite dishes are prepared at home. In fact, for someone who didn’t know how to make chai, just the other day, she cooked Khow Suey,” says Bharat who loves Esha in salwar kameez more than anything else. Though Esha was bowled over by Bharat’s dashing looks, she says nature wise he’s more like her mother. “Like mom, Bharat is raring to go every morning with things well planned. Dad and I are laidback – ‘karenge’ types. Mom and Bharat keep me on my toes,” she laughs. For someone who has seen the hi-jinks of glamour and the shenanigans of relationships what was it about Bharat that made her commit? “I realised that he’s someone who’ll be mine and remain loyal. I’ve always been a protected child but now I feel even more protected. I don’t feel like a lost soul anymore. There’s more purpose to life, something to look forward to. There’s a companion to hold my hand, haath pakdne wala koi hai,” says Esha softly. “Bharat’s outgoing yet traditional. In a way, he’s like Papa; he knows how to keep his family together. If he can love and care for them, he won’t let me down either. Also, he’s comfortable with my celebrity status. He doesn’t view me as Esha Deol, he knows me as Esha, his friend.” Smiles Bharat, “I’ve not married her for the brand name,” and adds that he liked her in Yuva and Na Tum Jaano Na Hum. Together time for them would mean dinners and parties. “We also love travelling, we love adventure. We don’t enjoy seeing monuments as much as we enjoy lazying on the beach and soaking in the vibe of a city. Recently, we covered Barcelona, Ibiza and the French Rivera in Europe,” says Esha. “Esha likes holidays, so we took off for Bangkok during Diwali,” says Bharat. “He bought me my first Louis Vuitton bag there,” she smiles. They have their little tiffs but Bharat says he’s the one who sorts things out. “I don’t like arguments while she has the habit of repeating things. But I’m the first to make-up, I don’t have an ego.” He insists Esha is the more ‘possessive’ of the two. “I’m possessive but not as much as she is. Pakad kar rakhti hai mujhe.